Francine's Friends: Get YOUR Indiana IBCAT License Plate! Francine’s Friends is a 2017 recipient of a grant for breast cancer screening from the Indiana Breast Cancer Awareness Trust, Inc. (IBCAT). In 2017 alone, IBCAT granted nearly $400,000 to 34 organizations dedicated to screening mammography and diagnostic programs, including Francine’s Friends. 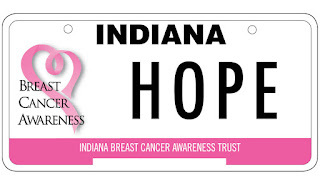 IBCAT receives funds through sales of breast cancer awareness specialty license plate. Each IBCAT license plate sold generates a $25 donation. The Indiana Breast Cancer Awareness license plate can be purchased online or at any Indiana Bureau of Motor Vehicles (BMV) branch. The mission of IBCAT is to increase awareness and improve access to breast cancer screening, diagnosis and support services throughout Indiana. For more information on IBCAT, visit breastcancerplate.org.